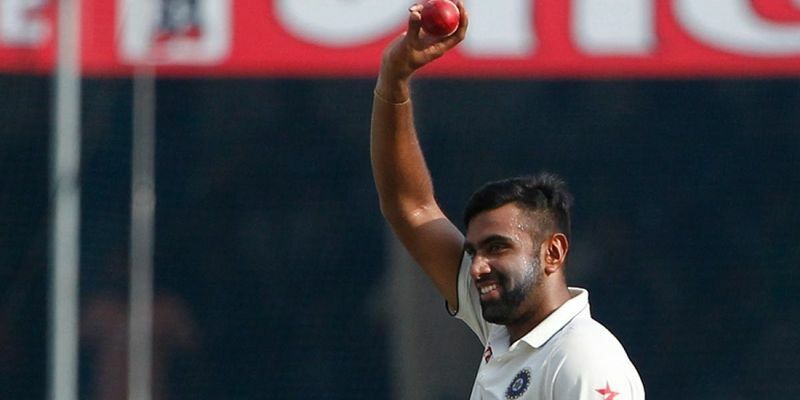 Ravichandran Ashwin added three more wickets to his Day 2 tally as India dispatched England for 255 runs in the first innings in the second Test at Vizag. Despite losing three quick wickets in their second innings, Virat Kohli's aggressive fifty increased India's lead to 298 runs by end of day 3. After starting the day 3 at 103/5, England's batsmen Jonny Bairstow and Ben Stokes put in a dogged display to counter the Indian spinners in the first hour. The duo were impressive with their footwork while facing Ashwin and Jayant Yadav on a pitch that kept getting slower with every passing hour. While coming out to the crease, Bairstow appeared to have twisted his ankle and had to go back in to get some treatment. India's struggles with the DRS continued as Ashwin wasted the last review for an lbw shout when the ball had quite clearly been swept away by the bat/glove. A few overs later, Ashwin would have realized his mistake when Stokes decided not to offer the shot to a ball angling into the stumps. The ball made contact with the pad outside off stump but the umpire sided with the batsman. However, replays suggested that a review might have sent the all-rounder back at the score of 21. After that, England produced a brilliant display of Test batting with both Stokes and Bairstow not giving the Indian bowlers a sniff of their wickets. Both Englishmen crossed their fifties while England moved closer to the 200-run mark. Surprisingly, it was a pacer who got the Indians the breakthrough they craved for. Bairstow tried to hit a Umesh Yadav ball on the off stump down the leg side, but the ball lacked the pace he was hoping for and ended up smashing his stumps after going through his pads. Following the wicket, England scored just one run in 15 balls as both teams broke for lunch with the score at 191/6. Despite providing the vital breakthrough by removing Jonny Bairstow, Umesh Yadav frustrated captain Virat Kohli with his spell after the lunch. While Mohammad Shami bowled decently after the second new ball was taken, Umesh often bowled short strayingfrom his line as Adil Rashid and Ben Stokes picked him for easy boundaries. But, Ravichandran Ashwin once again came back into the game after a quiet morning session by trapping Ben Stokes in front of the wicket. Stokes, who was looking good on 70, went for a review but failed to reverse the decision leaving England at 225-7. Jadeja made quick work of Zafar Ansari by removing him for an lbw five overs later. Ansari wasted England's second review of the session with the snicko showing no inside edge before it hit the pad. Adil Rashid then tried to forge a partnership with Stuart Broad, who batted down the order due to an injury scare, by adding 21 more runs. But Ashwin ended the hopes of a late fightback with two lbws of Broad and James Anderson in consecutive balls thus bowling out England for 255 runs. With a lead of 200 runs on their side, India struggled against the England pacers after starting their second innings. After playing 6 overs and scoring 8/0 before the Tea, India were put on the backfoot immediately after the break. Stuart Broad's seaming delivery seemed to have hit Murali Vijay on the pad before landing into the hands of Joe Root in the slips. But Rod Tucker was unmoved, and the visitors immediately opted to challenge the decision and won it. England won yet another review when KL Rahul had a faint outside edge off Broad's bowling with the score at 17/1. But captain Virat Kohli was bullish in his approach, scoring at a quick rate against the English pacers. James Anderson then ran through the defence of Cheteshwar Pujara putting India in a fix at 40/3. But Indian vice-captain Ajinkya Rahane calmed the nerves by adding 58 runs for the fourth wicket alongside Kohli. The Delhi batsman reached his fifty in 63 balls scoring five fours in the process as India ended the day at 98/3. India will look to add to their lead of 298 runs with Kohli and Rahane looking in fine touch.